Now let's get into the detail. There are three levels of Low Tech Combat. They are strategic, operational and tactical. This site Low Tech Combat focuses on the strategic because it is the most important aspect and the most widely neglected in self defence. 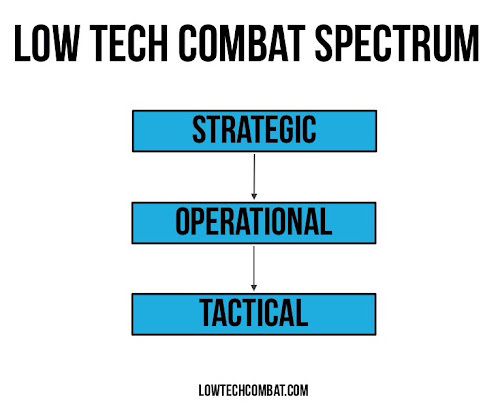 Low Tech Combat is about strategic self defence. Many people go to classes and train regularly without stopping to consider if they are on the right path for them. Is what I am doing best generating desired skillsets? This goes beyond self defence. Many people react to various stimuli and go about their days without stopping to pause and reflect if they are achieving what they truly want to achieve. The Strategic level drives everything else, including self defence and combative skills. Or it should. If you do not make strategic considerations and decisions you are simply reacting to life as it unfolds in front of you and will not achieve what is important to you. If you are unsure of the differences between strategy and tactics, you really should go and read this post first. Go and do that then come back. Done? Good, let's continue. 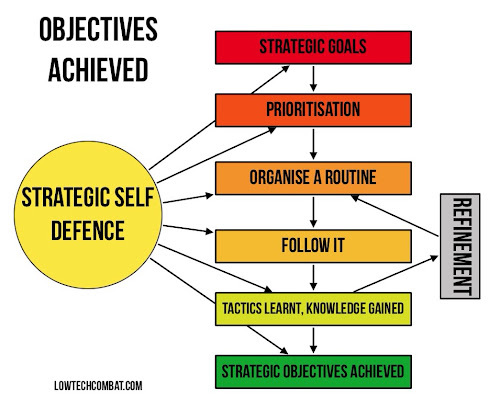 "Strategic self defence drives operational processes such as a training regime and then at these sessions tactics and techniques are learnt that fit into your strategic objectives." This is how it works. It is very simple. This is about identifying and developing long term personal goals. This is big picture stuff. What do you want to achieve in your life? What do you want to experience? Imagine you are on your death bed and are looking back on your life. What would you regret having never done, never tried or never pursued? What will you regret having wasted your time with? Strategy can apply to martial skills however at this higher strategic level martial aspects also overlap with everything else in your life. This is important. All aspects of your life at the strategic level SHOULD be synchronised. Your martial training should fit in with your family life which should fit in with career which should fit in with education which should fit in with health and fitness which should also fit in with other hobbies and leisure time. It all comes down to priorities. 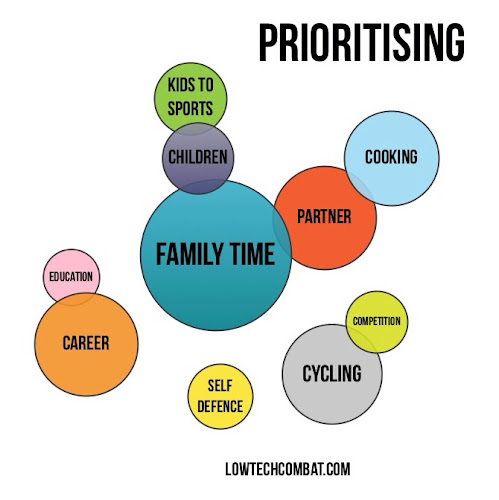 Deliberate prioritisation not random bouncing around. Are you keen on competing in MMA? But is your family also vital to you? Do they get neglected when you combine a busy work life and after hours study with a busy training regime? What's more important to you? To achieve your personal goals in this regard or be a better parent and have more input into your children's life? Will focusing on competing in MMA make you a better parent or is it just an excuse to be selfish? On the flip side, is not doing it simply an easy out? This is strategic stuff. This is the most important stuff. Thinking about this and making the right strategic decisions is what will make you happy in life and let you feel content when you are on your deaths bed looking back at your life. Strategic elements of your life MUST be in order if you are to have a rich and fulfilling life where you focus on what is truly important to you. When you think strategically about your own life, everything seems clearer. "Perspective can make some decisions much easier to make when viewed from the top down." Considering and making strategic decisions can take time. These are deep and fundamental goals that will have a great impact on your life. They need to be well considered. Do not rush this vital stage. Strategic decisions should drive your weekly and daily routine. How much time am I willing to be away from my family (if relevant) to train each day? How many days a week am I willing to train? Why do I really want to train? Self defence, you like a particular martial art, for health and fitness etc. Are martial arts the right thing for me? Do I want to compete? How seriously? Is there a better way to achieve my actual goals? Is what I plan on doing really the best way to achieve my goals? What should I focus on? Knife defence, mugging scenarios, competition, street fight (assault) scenarios, home security etc. What other things could I be doing that more effectively lead me to achieving my strategic goals? 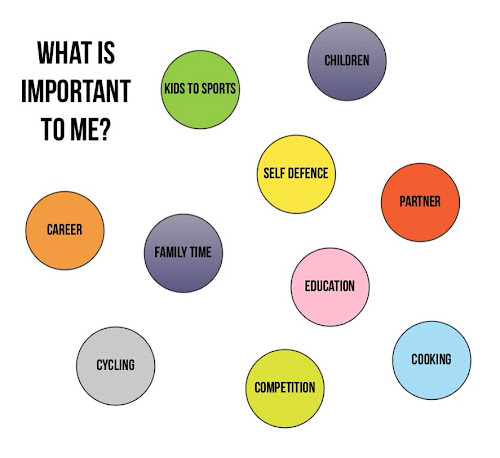 If I am interested in many aspects of training, what are truly the most important to me, or my family and I? These questions should fit in to further big picture questions about your life. There is only so much time in a day. On the flip side of that coin, there is more time available to be productive each day than we are happy using. Television and mindless Internet surfing (Facebook, YouTube and twittering etc.) can consume hours before you even realise. These strategic decisions can take time. So take time. These considerations and questions may drive a lot of change in your life. 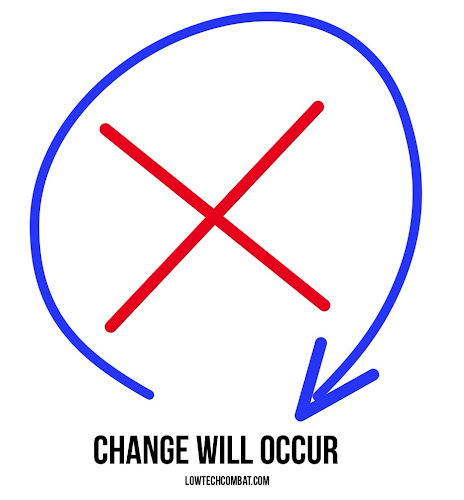 Change can be uncomfortable. "Change can be scary, really scary." You may leave one gym to go to another. You may leave these good training partners you have gotten to know. You would have been comfortable there. You may go to a gym and start all over again. You will be the new guy again. This can be very humbling. You may not know anyone there. The training culture may be very different. You may struggle, even make lots of mistakes. But that is the point isn't it? To learn something new? To learn something that is more important to you than what you were doing? Whatever the pains of change, they will be good pains. They will be growing pains. Remember the last time you made a big decision that changed your life? Remember how exciting things were? It could be that you moved cities to where you knew few people. You may have decided to join the military or police force. You may have taken that great job across the country or on the other side of the world. You may have asked that girl to marry you. You may have changed careers. These are big events. It is these events that define us. These are strategic points in your life that define your life. Taking your own responsibility for your own safety and security and for that of your loved ones is taking the mature approach. You are generating independence and a new level of self reliability. 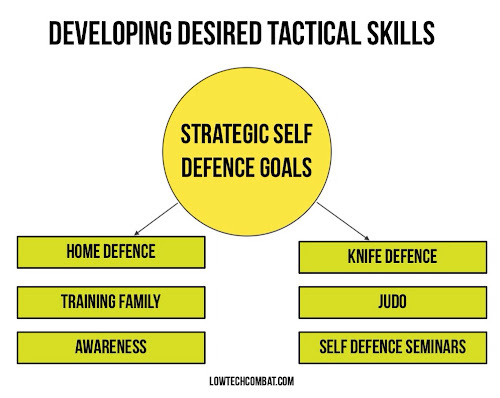 There are many paths (and many lead to dead ends and to cheap rip off neighbourhoods) to consider when deciding to take on this responsibility to look after your own safety and security through wanting to learn strategic self defence. Making the right decision at the strategic level will save you a lot of wasted time and resources in the long run. Making this mature decision to learn self defence for yourself and family should also fit into other big picture areas of ones life. The self defence aspect should not clash with other aspects. You will know what the other important aspects are to you. Once strategic decisions have been made and you know what you truly want to do or achieve in your life, you need to plan how you want to go about achieving your goals. You cannot do this stage if you do not know what you want to do. There is no way around this, but this stage will also take some time to do well. None of this stuff is easy. If it was, everyone would do it and everyone would be living rich fulfilling lives and nobody would be full of sadness and regrets in their old age. In the context of self defence, the operational level is where your training routine is developed. Monday here, Tuesday there, Wednesday do this and so on. 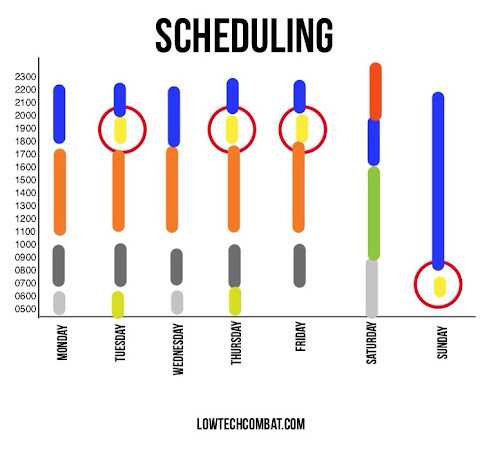 A regime can be broken down further into time slots within days for busier people. This is where daily, weekly and monthly routines are developed that aim to achieve strategic goals. When you follow your operational training regime and your routine, you will go to classes, go to courses and read books. At these classes and courses, you will learn techniques and tactics. This is the doing aspect. What you are learning is highly targeted towards your strategic goals. When you read books about subject matters important to you, you will develop knowledge that matters. During your strategic appreciation you decided that what is most important is home defence and knife defence. One aspect of this that you implemented in your training regime was knife defence training. You practise a Filipino weapons based system but also go to four specialist seminars each year to transfer those 'fighting art' knife techniques into reality based and focused approaches. The skills and techniques are very much there from the Filipino training and these seminars fine tune your approach and focus you on your end goal of wanting to be able to have a decent chance of defending an edged weapon attack. You learn how knife attackers hold their weapons, you learn whether knife attackers display the weapon or are more likely to hide it. You learn what type is more dangerous. You learn about and understand and feel physiological responses under stress through sparring and scenarios. These tactical level skills are very much in line with your strategic goals. As you get into the training your knowledge of knife use will expand. You will probably read books and articles about knife crime and the underlying violent dynamic of knife use. As your knowledge in the field improves, you may adjust your training regime, cut some things out, introduce better elements or do more of a good thing. This is called progress. This is good. This is how strategic level thinking about self defence and martial arts can and should drive everything that you do. There is only so much time in the day, so many days in a week, so many weeks in a year and so many years in your life. Don't waste this precious time. Don't waste your time doing things that are not really that important to you. Make that commitment to take some time to consider your ultimate goals and dreams. Then make those plans and routines to make that happen. Then stick to those operational plans and go and learn those tactics and techniques that you most want to learn. Discard the rest. Put pen to paper and work on your strategic self defence direction. Yep, it sounds like a lot of work doesn't it? You can grab life by the balls and let your strategic goals drive what you do or you can take the easy route and just bounce around and let life steer you. Your call. Did you find this article helpful? If so, please share it with a friend. Thank you in advance.